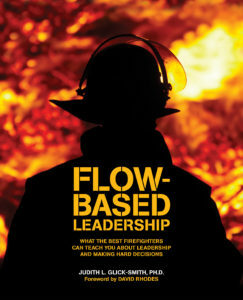 Flow-based Leadership: What the Best Firefighters can Teach You about Leadership and Making Hard Decisions, by Judith L. Glick-Smith, Ph.D.
Judith (“Judy”) L. Glick-Smith, Ph.D., has been a communication expert, knowledge architect, and organizational development consultant since 1983. She is the founder of MentorFactor, Inc., which focuses on helping organizations facilitate flow-based work environments. Judy has been studying flow-based decision making and leadership in the fire service since 2007.